and services for the automotive, energy and engineering sectors. The family-owned firm is in the fourth generation. When the automotive division of the BENTELER Group started operations back in 1935, it was an era when cars had long hoods and running boards and seat belts were by no means standard. Since then, much has changed in the automotive industry with safety, environmental and design standards unrecognisable from these early days. The demands placed on individual components are also more complex, leading to refined production processes and enhanced quality control.BENTELER has also changed. The automotive division has around 26,000 employees and 75 plants in 24 countries. Developing tailored solutions for some of the world’s leading automotive OEMs, its products include automotive system solutions and modules for chassis, body, engine, and exhaust systems as well as systems for electric vehicles. One area in which the automotive manufacturer has evolved is quality control. BENTELER invests in the further optimisation of its processes and uses digital technologies in order to be able to provide highest quality to its customers. Its site in Vigo, Western Spain, was using a traditional approach to inspect the quality of parts via Coordinate Measuring Machines (CMM). However, BENTELER felt that the process could be improved – both in terms of time required for inspection as well as limitations with regard to the information captured – and decided to change its concept. The company moved the process from the laboratory to the production area and opted for ABB’s fully robotised automatic quality inspection solutions, which digitise the inspection process. They employ 3D white-light scanning sensor technologies, using digital scans to optimise inspection and quality assurance. The sensors can detect defects on a manufactured part with an extremely high level of accuracy. ABB’s solutions are based on 3D metrology, where a scanning system projects a grid of white light on a manufactured product’s surface. It rapidly records highly detailed geometric and surface data to create a digital model of the manufactured part, which can then be compared to the part’s original CAD drawings. This is a very precise and rapid process that does not slow down production. Automating the inspection of manufactured parts and pieces helps plants to reduce cycle times while raising quality and reducing the risk of quality control errors. It also allows manufacturers like BENTELER to validate that the quality of their products is equal to the high standards of the automotive OEMs. 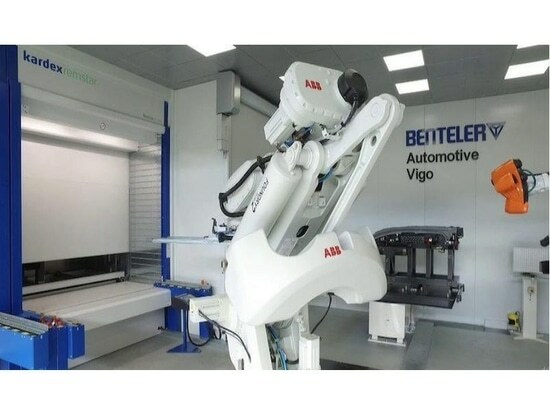 The technology, which is part of the portfolio of ABB Ability solutions that connect customers to the industrial Internet of Things, enables a high level of automation with advanced data analysis, leading to more flexible manufacturing and moving BENTELER’s production processes a step closer to the factory of the future. As manufacturers increasingly aim to improve quality and productivity while accommodating greater product variation and customisation in smaller lots, the ability to efficiently automate quality inspections offers the kind of competitive advantage that BENTELER was seeking to achieve. More measurements, higher speed ABB’s 3D white-light sensor-based solutions can be used for both off-line and in-line inspection. BENTELER decided to install the off-line inspection solution. This system makes the typical measurements previously made with the CMM and generates control reports both internally and to the client. Integrating a robot with the 3D measurement technology allows a very high capture speed in addition to a large number of measurements. The system works conceptually like a production cell, with emphasis on performing the maximum number of measurements in the shortest possible time. For this purpose it has two measuring tables. A second robot loads and discharges the measuring tools, including the pieces to be measured, automatically according to the production queue generated by the operator. This concept allows continuous measurement, resulting in high productivity. BENTELER also decided to install three in-line cells with equipment that measures structural safety parts such as the rear axle and the motor cradle. Using the same technology but adapting the functionality, systems are integrated at the end of the production line that are capable of measuring 3D geometry using optical, non-contact scanning, in place of more traditional mechanical control tooling. All parts can be put through a 3D dimensional control in continuous mode to ensure that any defects can be identified quickly and efficiently. Checking parts in the course of the manufacturing process rather than at completion, and having the process integrated into the production area rather than separately located, allows industries to increase the productivity, precision and quality of their manufacturing. It also results in quality control for 100% of finished parts, and significant cost savings. In addition, such solutions promote collaboration by optimising the work of the control and supervision operator. Compared with traditional methods, in the same time that it takes CMM-based technology to inspect a 3D point, the 3D vision and metrology solution from ABB allows up to five million 3D points to be inspected without touching the part. Manufacturers can achieve higher quality at a higher speed. Another major benefit is that every single part can be inspected. Today, production plants often rely on statistical quality control, a process whereby they take random samples. However, this means the same mistake can be repeated in many products until discovered, creating a lot of expensive rework and scrap. Continuous control of 100% of the parts helps avoid such costly outcomes. For tier 1 automotive suppliers like BENTELER, whose processes are evolving with the times, technology such as the digitised 3D inspection solution lets them validate their quality to large automakers, whose quality requirements are similarly exacting. Such technology allows all players to be able to see eye to eye on the question of quality. And just as BENTELER has kept pace with an industry in which integrated fenders, fully closed bodies and seat belts as standard are now the norm, it is taking steps that move it into a digital future.